I got this for Christmas, so I have only used it for a couple of days, but I love it already! Being a naturally wavy haired girl, the hair brushes I previously used were a nightmare on my hair, they would hurt my head so bad and pull so much of my hair out that the brush would be full of hair in about a week. In the end, I actually gave up with hair brushes, and would just drag my fingers through my hair a few times to pull apart any tangles, which was probably just as bad. 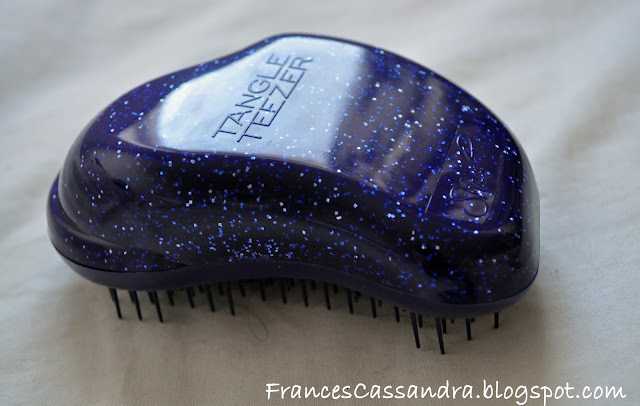 I saw so many good reviews on the Tangle Teezer so I really wanted to try it. My dad looked at me like I had gone crazy when I asked him to get me a hair brush for Christmas haha. If it hasn't caught on already, the Tangle Teezer is a detangling hair brush. It claims to brush out tangles painlessly and effortlessly, without damaging your hair. In all honesty, when you see and feel this hair brush for the first time, it seems more like a torture device, the bristles look and feel so harsh and sharp. But when I brushed it through my hair, it glided so smoothly through it, and it didn't hurt one bit. The Tangle Teezer can be used on wet or dry hair and is designed to be easy to hold in your palm. I was always worried about brushing my hair after washing it as your hair is more vulnerable to breakage when it is wet, but this hair brush is really gentle. 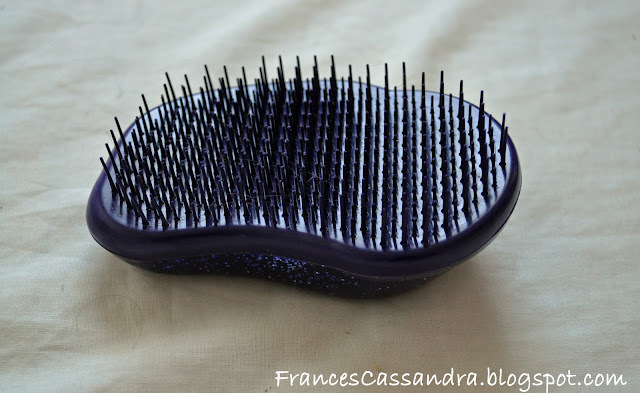 I still find some hairs caught in the bristles when I have finished brushing my hair, but there isn't half as much as when I have used other hair brushes; I think it is more due to the natural breakage of my hair, rather than the brush pulling it out. The Tangle Teezer also claims to make your hair shinier, which I am not too sure about, I don't know how it could. I think it just untangles and smooths you hair to make it look shinier. I would definitely recommend the Tangle Teezer, especially if you have wavy, tangle-prone hair. You can buy it from their website or Boots for around £10-£13. That may seem a bit steep for a hair brush, it is one of the factors that put me off buying it for a while, but I definitely think it is worth it. It comes in quite a few different colours, such as neon pink, neon orange and black. I chose the glittery purple one as it wasn't too bright but it wasn't plain either. You can also buy a compact size for travelling or a flower pot style which can sit on your vanity and has storage for hair bands/ clips. Do you have a Tangle Teezer? What do you think of it? If you have any more post requests, let me know! Wow! I definitely need this! My hair is so curly when I wash it I always end up practicaly bald after loosing my patience and dragging my brush through it! This looks really cute + I'm sure it'd be very useful :). hello! I'm a new follower just come across your blog it looks fab! I don't think I'll be able to resist this much longer. Apparently the sound of me pulling my hairs out of my brush in the morning even wakes up my fiance and he managed to sleep through the sound of people chipping off our bathroom tiles before... Maybe this will actually help! I need a tangle teezer, my hair is so thick it's like the makeover scene in princess diaries every time I use normal brush! I love my Tangle Teezer, I got the black and gold compact. I've got wavy hair too and would be lost without it now. I long Tangle Teezer's! Great post. I've been debating on getting a tangle teezer now my hair is officially long after growing it for the past 18 months! I get really annoying knots underneath near my neck so this brush would be perfect! Cool, I have this and it really is amazing! I have the compact version- it's not bad at all.